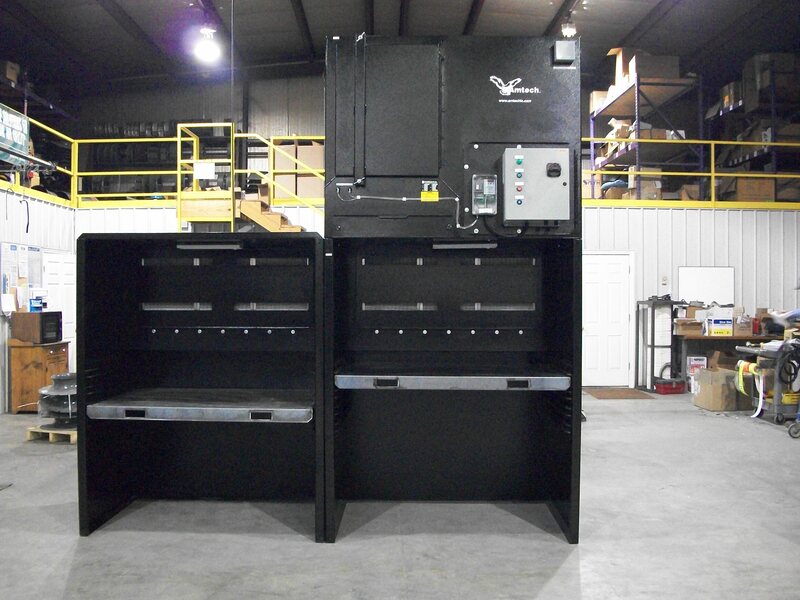 The WB Powered Welding Booth is a totally self contained Vertical Downflow system. It has a compact design that minimizes required floor space. •	Dual Unit is designed for 4,000 cfm @ 4” WG or 2,200 cfm @ 4” WG for Single Unit. •	Versatile Booths. Can be positioned side by side or back to back. •	Requires no ductwork, reducing installation time and cost. Fast set-up. •	Reverse jet pulse design optimizes filter cleaning and extends filter life, reducing maintenance costs. •	Recirculates clean air, eliminating the need for expensive make-up air. Saves on Heating and Cooling Costs! •	Hands Free Capture promotes Safety and Efficiency. •	Spark Baffle Inlet Plenum on both Booths. •	Integrated Acoustical Sound Dampening Lining in Blower Housing. •	Capturing dust, smoke and fumes which helps in keeping a clean work environment. •	Removable Dust Tray 1.3 cu. Ft. Capacity.